A 732-acre conservation easement on the Bar B Ranch near Carey closed this week as a result of a $140,000 grant from the Blaine County Land, Water and Wildlife Fund. The conservation easement process began last year, when ranch owners Jim and Susan Barton collaborated with The Nature Conservancy to apply for the easement from the county. The Nature Conservancy contributed $50,000 of the cost of the easement and will monitor and enforce it. The Farm and Ranch Protection Program of the U.S. Natural Resources Conservation Service provided $190,000 of the cost, bringing the total price to $380,000. County funds came from the Land, Water and Wildlife Levy, a two-year, $3.4 million assessment that is part of county property taxes and is meant to preserve open land and farm space from development. 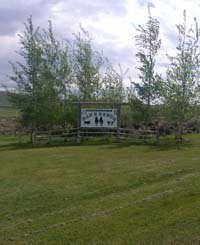 The Bartons retained the right to build a new single-family residence on the ranch within the existing farmstead area. However, the rest of the ranch will be preserved for agricultural use and conservation in perpetuity. Mark Davidson, spokesman for The Nature Conservancy, said during a county meeting in August that the ranch, which is mostly sagebrush steppe, is an important habitat for sage grouse and pronghorn antelope. Raptors, songbirds, elk and deer also have habitat on the ranch. Clare Swanger, project coordinator for the levy, said in a press release that the ranch is in a “transition zone” between the Pioneer Mountains and Craters of the Moon National Monument. The land in this area is a complex pattern of private, state and federal property. “Every key parcel of land conserved, of which the Bar B is one, contributes to the permeability of the landscape through which wildlife can travel,” she said. “It took patience and determination from everyone involved,” he said. The Bar B Ranch is the second project to receive county funds. The first was a 1,100-acre conservation easement on the Flat Top Ranch near Carey, owned by John and Diane Peavey. Blaine County contributed $200,000 toward the purchase of that conservation easement in December.